Through the Vernon Neighborhood Association, neighbors old and new can work together to shape the future of our neighborhood – from Alberta Street to Alberta Park – by taking on projects, taking up issues, and taking action together. The Vernon Neighborhood Association strives to actively initiate, promote and implement programs that connect the diverse neighbors in this community. We work to build a safe, resilient neighborhood informed by its rich cultural history. Through listening and sharing we cultivate community engagement. The VNA has an all-volunteer board, elected each October. Our board meets the 3rd Wednesday of most months (see the schedule at right). You can contact us at VNABoard@gmail.com if you are interested in speaking or suggesting a topic. Our 2018 schedule is at the upper right of this web page. The easiest way to follow our activities is on the VNA Facebook page, or by signing up for our newsletter at right. Do you live in the Vernon? Our neighborhood is bordered by Ainsworth and Wygant, from approximately NE 22nd Ave to NE 10th. (The boundary jumps around a little from NE 14th Place to NE 10th). 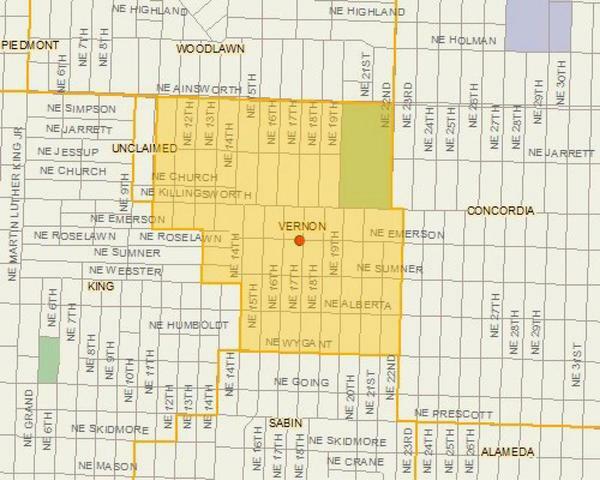 If you live in the boundaries of the Vernon neighborhood, you just fill out the simple membership form below (or at a board meeting) to declare yourself a member. Business and organizational representatives are also eligible (see bylaws for restrictions). There is no cost to join the organization because we are sponsored by the Portland Office of Neighborhood Involvement. Are you interested in getting involved? Please tell us about your areas of interest. Help us choose the 2018 Movie in the Park! We send once a month or so, with a few notes in between. We do not share your email address with others. For other objectives as approved by the Board of Directors or membership. If you are interested to know more about the governance of the VNA, you can check out our page on the Northeast Coalition of Neighborhood website, or download the Vernon Neighborhood Association Bylaws. Or ask a board member, because we love meeting our neighbors! This beautiful park is in the Vernon neighborhood. How lucky are we? The background image on this page is "Alberta Park (Portland, Oregon)" by Jason Marlow. You want to see more of the Vernon neighborhood? Check out this (uncurated) photostream on Flickr.